Alok Tandon, Chief Executive Officer - INOX Leisure Ltd added "Ensuring a great viewing experience for our patrons has always been our foremost priority, which inspires us to continuously reinvent & innovate and bring the best technology for them. Further to this endeavor, we are proud to announce our association with ScreenX, which will enable us to offer an unprecedented 270-degree cinema-viewing experience on three walls of the theatre. This new form of storytelling would deliver the narrative in a more convincing manner, leaving the audience breathless. This is a massive milestone in the glorious history of Indian cinemas and we are proud to be the ushers of this new technology." 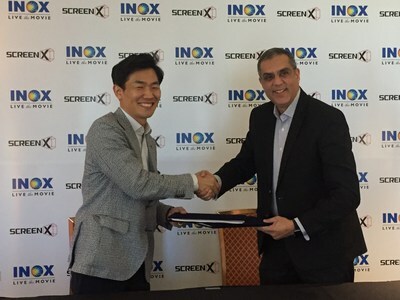 "We are very pleased today to be signing a new deal to expand ScreenX to across India with our partner INOX" said JongRyul Kim, CEO of CJ 4DPLEX. "We are incredibly happy to be working with such a great new partner in revolutionizing the Indian cinematic landscape and we are look forward to developing a long-lasting partnership with them in the years to come."